Home » fallout 4 , video games » FALLOUT 4 gets a release date and a REAL Pip-Boy! 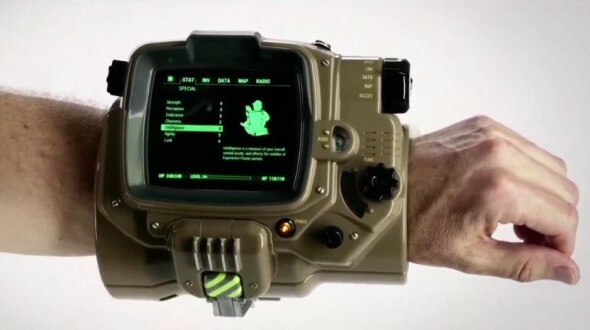 FALLOUT 4 gets a release date and a REAL Pip-Boy! Game studio Bethesda unloaded the big guns last night at their first-ever E3 presentation. 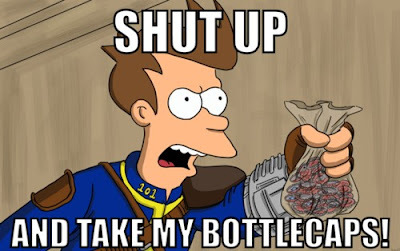 Since its announcement months ago the hype had been stoked about Fallout 4. Then two weeks ago Bethesda lifted the cover on that mega-anticipated title with this toad-strangling doozie of a trailer. So what else could Bethesda bring before us at this point? By the time Bethesda execs got to Fallout 4 last night the keynote was being watched by at least a million viewers over gaming broadcast site Twitch and probably just as many on Twitter. After going over some other games (including the new Doom, due next spring) it was time to enter the Vault. Because war... war never changes. Okay so, Fallout 4 is getting released this coming November 10! It's available for pre-order now. And look! If you wanna spend $119 for the Collector's Edition you get a real-working Pip-boy! From the "Don't Really Need But Are Lusting For Badly" files. Wearable and functional. Usable with your iPhone or just about any other smartphone on the market today. Interactive with your game via an app. A whole lotta cosplayers are swabbing up drool looking at that thing this morning. I'm not ashamed to admit that Fallout 3 devoured about 120-140 hours of my life. That wasn't a game. That was a life-impacting experience on par with a Star Wars movie or having tickets to the Super Bowl. With Fallout 4, I'm expecting no less. I know what it's like to be completely absorbed into a game for a while. Truly magical.